If you know me, you know how I feel about sushi. I’m a woman obsessed. To my thinking, there’s nothing better than putting myself in the hands of a well-schooled professional and saying “omakase.” Which, very loosely translated, means “Hit me with your best shot.” When it comes my obsession, leaving it up to to a talented sushiman (or woman!) is the best way to get a little taste of heaven. But when I’m looking for a quick, easy and far less expensive fix, I’m a sucker for kaiten. 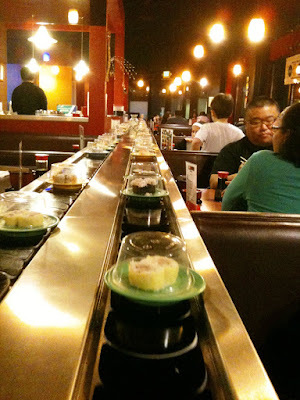 Kaiten (conveyor belt) restaurants offer a visual primer to the wide world of sushi and other Japanese-food favorites. 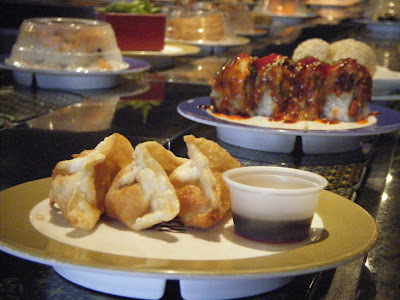 The movable feast, with color-coded plates that generally cost between $1 and $5.50 each, is perfect for the sushi novice, and kids love it too — as I explained in this month’s Ticket roundup (read it here). Lunchtime at Bellevue’s Sushi Maru, open since July. It’s not all about raw fish here — or elsewhere, so if that freaks you out, chill out. Maybe with something from the “beginner’s luck” department, like this gyoza? Relax! It’s a fried dumpling. They charge a fortune for this at your local seafood counter. At Maru, I paid $2.25. I shared a special order (lobster tail, advertised on a placard making the rounds) with the folks seated to the left and the right of me. Social interactions are not uncommon around the conveyor-belt, and so long as you say “excuse me,” a boardinghouse-reach is allowed, too. 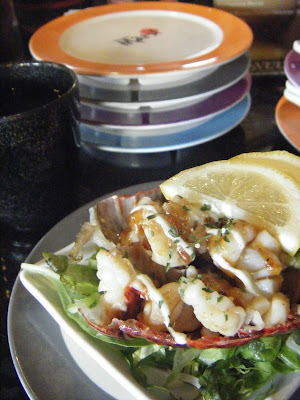 That’s right: a whole lobster tail, sauteed and returned to its shell — for $8! Eater Lori Takahashi turned me on to Tengu Sushi after it opened in November in Northgate’s new Thornton Place complex (thanks, Lori). Co-owner Kozo Sato looked familiar. Turns out he worked at Takara on the Pike Place Market Hillclimb for 11 years, prior to its closing. Sato-san rolls a proper futomaki. He’s had plenty of practice. Since then, I’ve been back several times, and now he recognizes me. “Where’s your son?” He asked one afternoon. As you probably know by now, the apple doesn’t fall far from the tree. 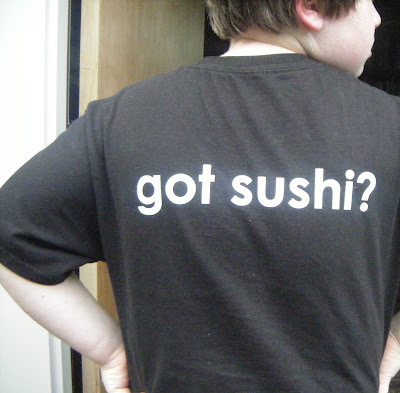 Nate’s favorite sushi T-shirt. He’s got a stack of ’em. The layout is a bit odd at Tengu, with low glass partitions throughout the room, but if you’re lucky, or patient, you can snag a seat in front of the kaiten kitchen and — if he’s not too busy — chat with Sato-san. Shy? 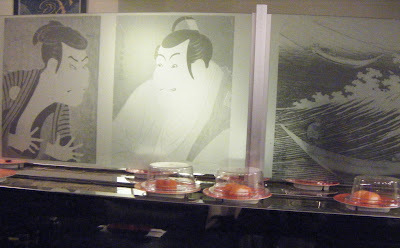 At Tengu, you can dine solo and stare at a glass partition. These guys won’t mind. Among the things you need to know about eating at any kaiten restaurants is: There’s a menu, too, and you should feel free to order from it (that’s where you’ll find things like miso soup, udon noodles, and special appetizers hot or cold — among other dishes you won’t see on the belt). 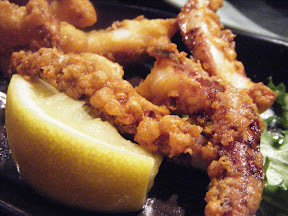 Tentacles at Tengu: chilled or fried, you decide. 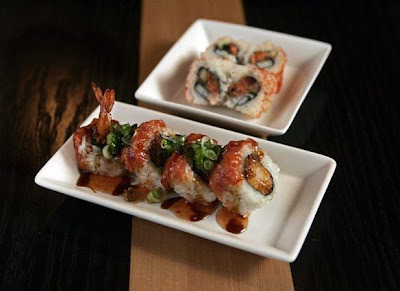 Also: If you don’t see your favorite type of nigiri-zushi (pressed sushi) or maki (roll), ask. They’ll make it for you fresh. Even if you do see what you like, but you don’t like what you see, they’ll make it for you fresh. And if they don’t, well: find another place to eat kaiten. 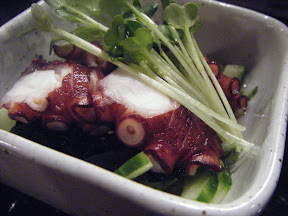 There are enough of them, including iSushi in Issaquah, which didn’t make it into my roundup. However, if you’re in the neighborhood, you should give it a try. I eat lunch at Genki Sushi, in the Mercer Street complex that houses QFC, quite often. Ditto for Sushi Land in Lower Queen Anne, which is just up the block. Both are close to the Seattle Times office. Genki is groovier and more intimate. Sushi Land is funkier and more frenetic. Genki has a full bar, Sushi Land often has a full-house. Genki has Osaka-style “stick sushi” — blocks of rice with marinated saba (mackerel) pressed onto it, and I love that stuff. 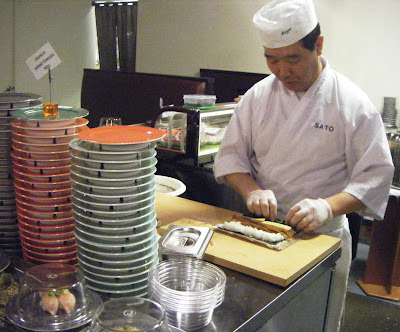 Sushi Land is way cheap: I can fill-up with 8-10 plates and still get out of there for $15. 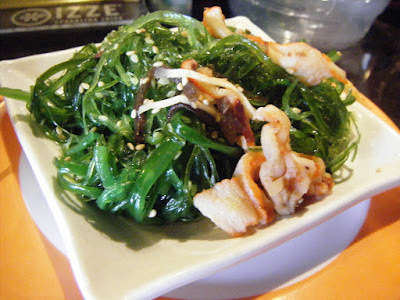 Genki (like Sushi Land) is a bigtime Japanese import, with a big following in Hawaii. And what do you know? They’ve just opened a second local outpost in Renton, near Uwajimaya, with another on the way on Capitol Hill, across from Seattle Central Community College. Sushi rolls at Genki near Seattle Center [Seattle Times photo: Mark Harrison]. Speaking of Renton, I’ve got to tell you I was surprised and impressed with izaKaya — the kaiten restaurant and bar at The Landing. This newish shopping mall reminds me of Redmond Town Center and, like Thornton Place, has a Regal Cinemas right across from the kaiten outlet. 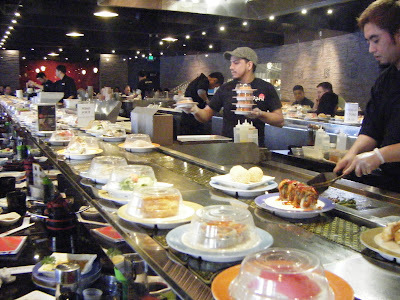 I was also surprised to learn it’s kin to Bluefin Sushi, the all-you-can-eat seafood buffet at Northgate Mall (which, if you haven’t been, is worth checking out). IzaKaya at The Landing. Funny, how so many of these kaiten places are in shopping centers. I guess they figure there’s a captive audience of folks looking to dine and dash. 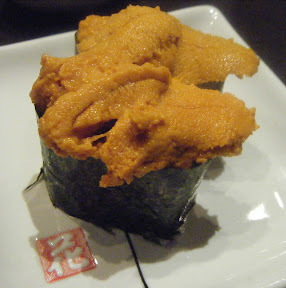 Hamachi nigiri (left) and uni, served gunkan-style. 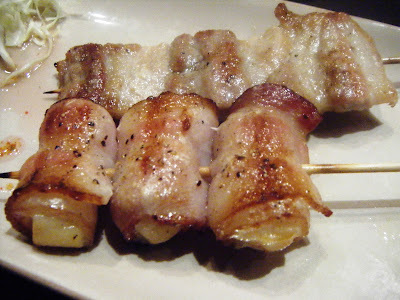 Grilled bacon-wrapped scallops (foreground) and butabara (pork belly). 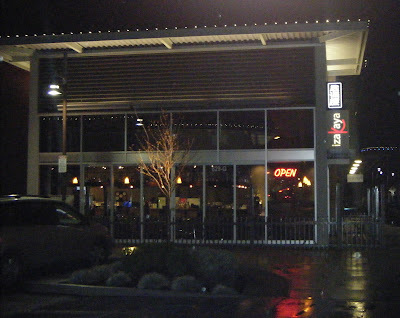 And then there’s aa Sushi in Avalon Juanita Village — about a minute’s walk from Cafe Juanita in Kirkland. 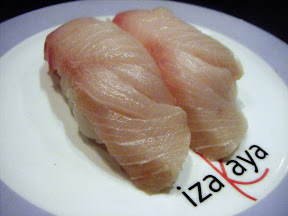 (iSushi, izaKaya, aa Sushi: what’s with the lowercase?) What a fun and friendly place! We went on the early side, when the local folks come out and bring their kids. We brought ours, and as usual, he stacked up a few plates. Me too. 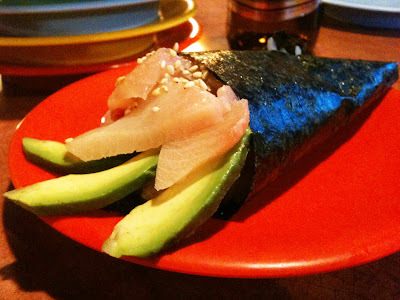 My hamachi handroll: a special order. Here, instead of having stools facing the conveyor belt (and a handful of tables), the restaurant is long and skinny, with booths surrounding the belt and tables in the way-back. 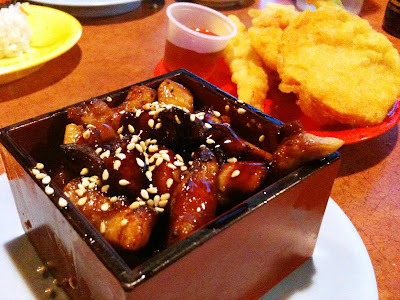 Nate liked aa’s teriyaki chicken ($2.50) and I was impressed that the mixed tempura (shrimp and vegetables) was only $3. No wonder families like it here. Anyway, I sure hope if you’ve never been to a kaiten restaurant, after taking my tour you’ll consider giving one a try. Did I miss your favorite sushi-go-round? Maybe you’re like my husband, who thinks the only way to eat sushi is to commune with a professional — preferably at an intimate little sushi bar where the chef knows you by name. Or perhaps you’re a certified sushi-snob who thinks you’re too good for kaiten? (Yeah, yeah, I’ve heard it before.) Bring it on! My comments box is open for business.